Durable and safe, this cute kit will spark a lifelong love of music while building fine motor skills. Can We Get a Beat? Years from now, when your mini Ringo is all grown up, they'll get misty-eyed telling interviewers about their first step toward superstardom—this kid-sized drum kit. It's durable and safe, so they can bang away all day (or during designated jam sessions), and you'll be happy you're nourishing a lifelong passion for music. 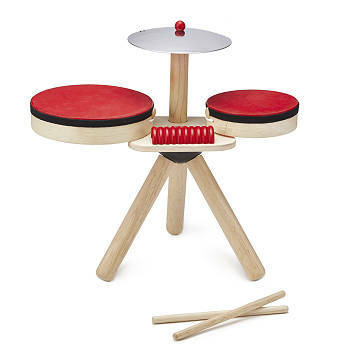 Includes two drums, drumsticks, cymbal, and guiro (a super-fun Spanish instrument with slats that make cool sounds). Made in Thailand. Clean with damp cloth only.